An amazing medieval center below the Templar castle ruins. Our room was right on the main square below the castle (you can see it lit atop the hill), near an awesome ornate church. We caught part of the mass. Meandered thru the narrow streets, dinner in a locals spot, listening to old men talk in yelling tones (that's normal here). Decided to spend the morning at Tomar Castle and use transit to drop us part way for today's 18-mile walk. Good choice! Carolo do Convento Cristo Convent of Christ Chapel and monks (not nuns) is a jewel. Built in the 1400s (crusades) octagonal rotunda with massive free-standing centerpiece dedicated to saints and doctors of the church. Click here for more views. One of the sacristy rooms, complete with built-in stone shelves (pictured above) and long basins with water coming in through the carved faces above the basin (pictured below). View from upper choir stall about 16 feet up and exterior of the rotunda as seen from the cloister courtyard. 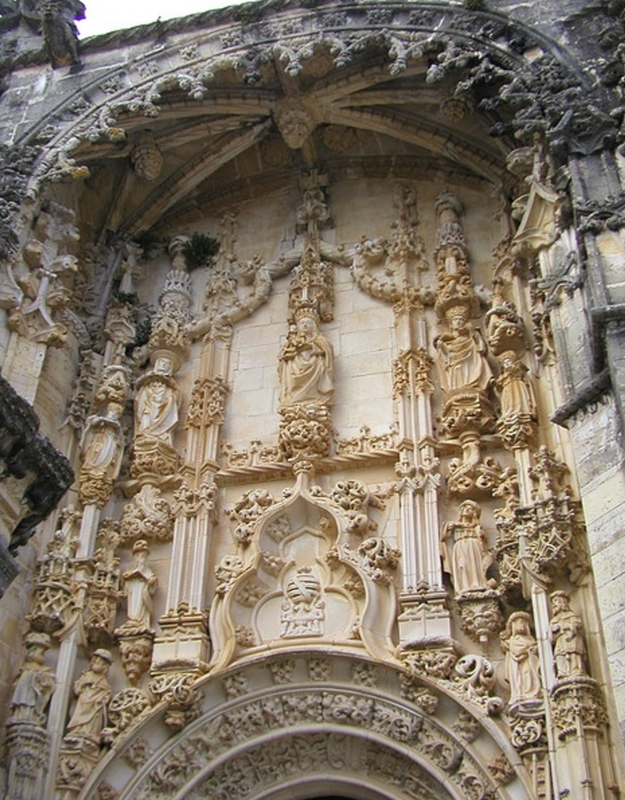 From an upper terrace where you can see the top of the entryway carving. It's phenomenally detailed. The monk dorms, connected to the chapel through cloister courtyard. Started in the 1400s, it's three mega-long hallways arms like a T with the center chapel, featuring an Ecce Homo terracotta statue in the chapel (by Encarnacsi, 1654). There's a 'fire room' near the center that feeds heat to each room through pipe-like space built into the walls (who knew?). The rooms are a bit larger than Andre's dorm room, though the doorways are small. Is Mike standing by the fire monk's room? Check out the blue tiles. They decided to gussy up the place in the 1600s, around when the Ecce Homo statue was added. Took a taxi part way after visiting the castle, only about 10k. 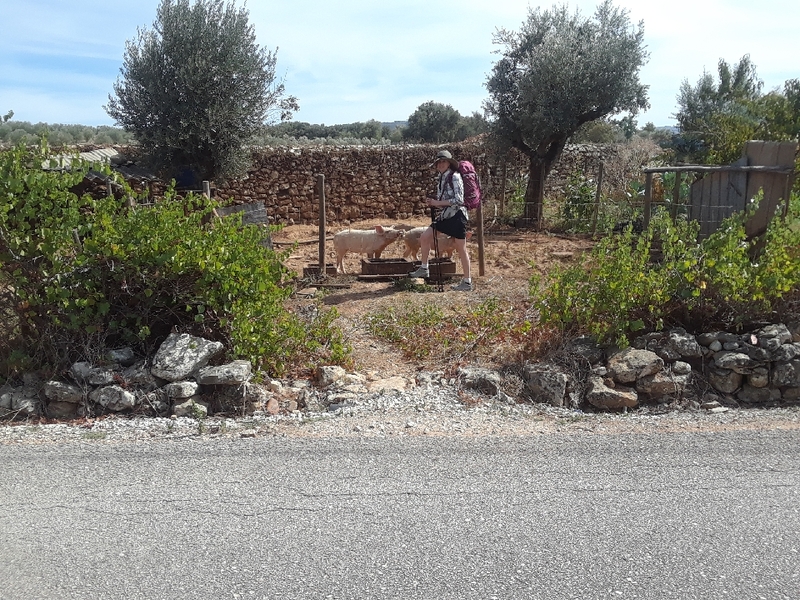 Partly on small highways, but then through towns on stone roads, with stone walls, houses with gardens, lots of "antique" abandoned buildings aside regular houses, and one set of pigs who seemed pleased to see us. Lots of olive orchards. One sleepy town seems to have pressed a lot of olives for oil. The town of Alvaiazere was pretty small... and, well, not much going on there. Apparently, it's a portal for hiking trails. Had a beer and pastries, noshed on fruit and leftover snacks from our bag. The name of the town is Arab word for Land of the Falconer, named during the crusades. Also, see the picture of Mike with the way marker. Yay! We're not lost!